Kids’ Hanging Toy Organizer Just $7.97! Down From $20! You are here: Home / Great Deals / Amazon Deals / Kids’ Hanging Toy Organizer Just $7.97! Down From $20! Clutter in the kids’ room, a situation many of you are confronted with. Organizing your kids’ toys can be a frustrating exercise. This is why Bennet & Bradley made this hanging toy organizer as a solution to this problem! You can keep your kids’ toys, stuffed animals, baby books, diapers, baby blankets and more! At Amazon, Kid’s Hanging Toy Organizer is now on sale for just $7.97 down from $19.99! THE FROG HELPS YOU ORGANIZE AND GET AWAY WITH CLUTTER: The Kid’s Hanging Organizer by Bennet & Bradley® is a handy product helping you to organize easily misplaced things and to create a clutter-free kid’s room. With three jumbo-sized baskets there is plenty of room to place lots of stuffed animals, toys, diapers, baby clothes, and more. No more messy shelves and drawers, the Frog stores it all. THE FROG BRINGS HAPPINESS AND CREATES SPACE: With the Frog’s happy face, big eyes, and vibrant color, he brings a fun energy to the kid’s room. The hanging organizer takes little space yet stores plenty of toys and clothes. 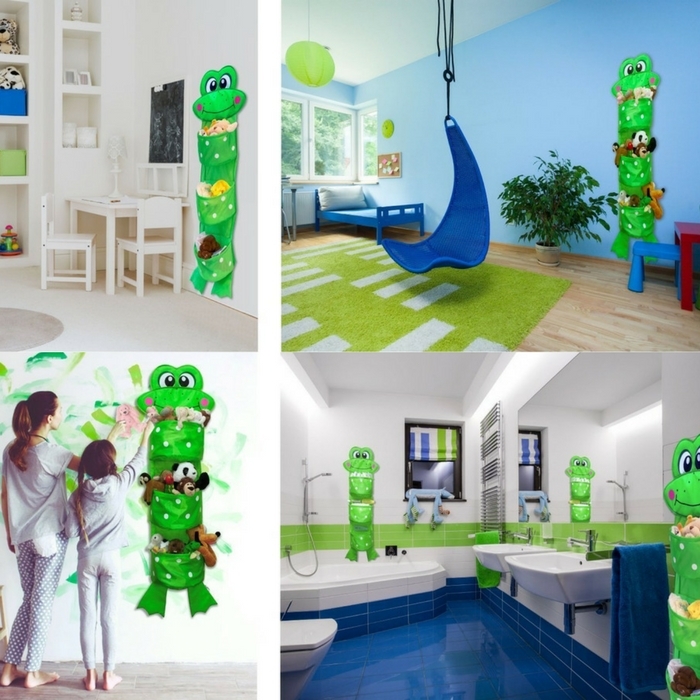 The Frog feels at home and is of use in kid’s rooms, playrooms and bathrooms alike. THE FROG GIVES YOU DURABILITY AND LONG-LASTING USE: Bennet & Bradley® organizers are handcrafted from a strong polyester, with extra fabric on the pressure points and double-stitched seams for durability. The three baskets have a wire-framed structure to keep the shape strong and solid. The Frog is 100% odorless and 100% non-toxic; with the eco-friendly material there is no potential harm for babies.